The weather to start 2018 has certainly been crazy. We had more than a week of temperatures in the mid-20s (Freezemageddon) followed by a week of moderate, more normal January temperatures. Now, we’re freezing again this week. 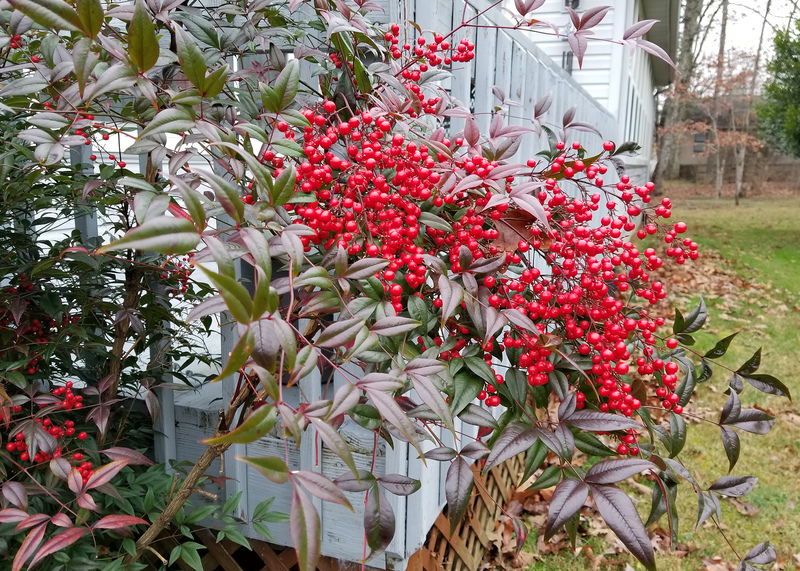 But one good thing that happens in cold weather -- as if anything good happens in the cold -- is we get to enjoy the foliage on many evergreen landscape plants that turn gorgeous shades of red and purple. 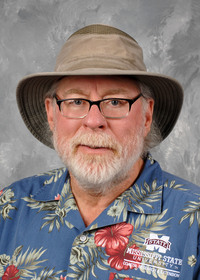 This is a physiological response, but I think the plants are simply cold. Boxwoods, cleyeras and some hollies are great examples of this color change. Who doesn’t appreciate evergreen landscape shrubs’ patina of bronzy golds and reds being displayed on winter foliage? 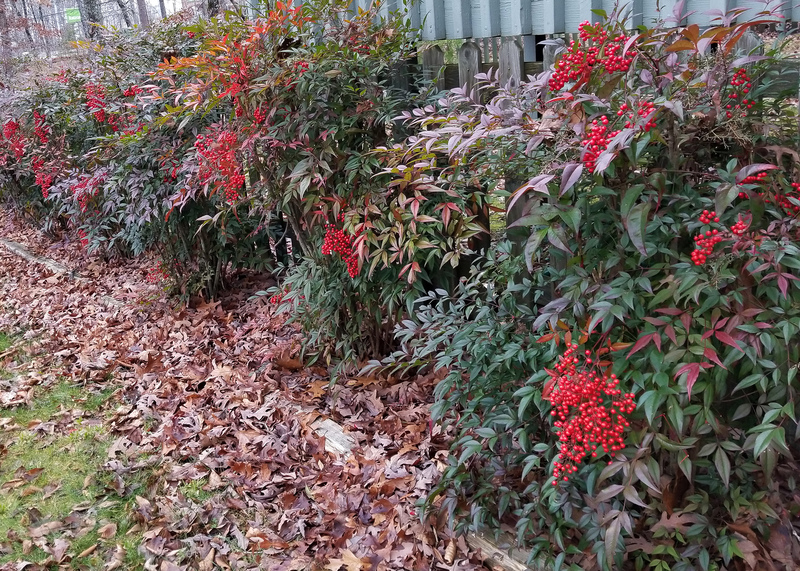 But I think the best evergreen plant for winter foliage color is nandina. I like nandina because of its exotic, tropical look, as well as a couple of its common names, like heavenly bamboo or sacred bamboo. The upright growth habit of the straight Nandina domestica species indeed resembles bamboo. The green foliage transforms to red for the cooler months. It is attractive and thrice bisected, adding to their charm. The intensity of foliage color depends on whether it is planted in full sun or partial shade. Colors are markedly more vivid with increasing sunlight. Nandina domestica flowers in the spring, with big panicles of white clusters. The red berries are the main event in the fall and winter. These clusters start upright, and as the berries mature, they weigh down the canes. If there is one problem, it is the potential for some weediness from the heavy fruit production. Several states have identified heavenly bamboo as invasive. 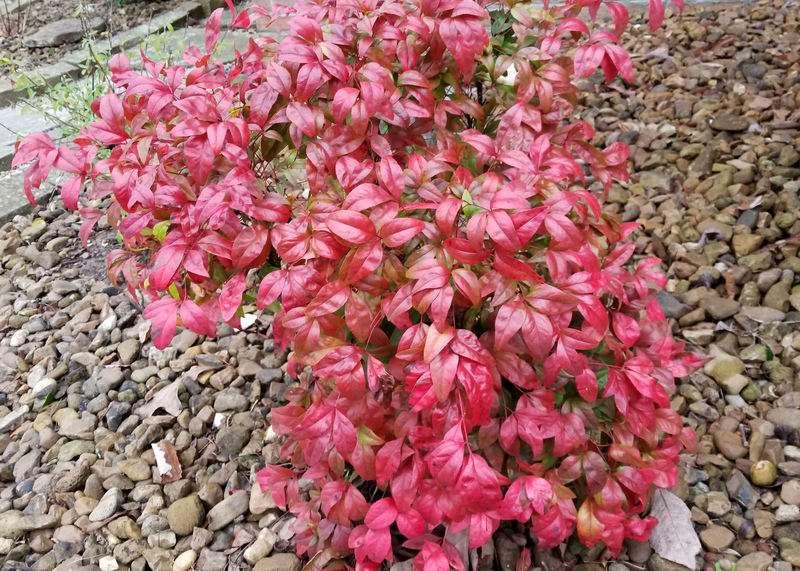 If you have a small space, you’re in luck, because dwarf nandina varieties have been developed to increase the landscape options. The foliage colors are even more exciting than the straight species. But most of the dwarfs do not flower consistently, if at all, so they do not have the gorgeous fruit production of regular species. One of the better dwarfs, in my opinion, is an old favorite called Firepower. It is a great choice for a small focal point or for massing together to make a statement. Firepower grows about 2 feet tall and wide, with a compact mounding habit. Other good choices are Blush Pink and Gulf Stream. A new and totally different colored nandina is Lemon Lime. The lime-green foliage of this beauty will brighten any dark spaces in the landscape. Because nandina tends to be a slow grower, my advice is to buy the biggest plants you can afford. Sometimes, homeowners buy smaller plants and place them close together to fill an area, but these plants ultimately become crowded, and some have to be removed. Buy large plants and transplant them according to their mature size. This actually results in better fill-in with fewer plants. As with all landscape shrubs, plant in well-drained soil, and use a layer of organic mulch after planting. Scratch a little slow-release fertilizer into the soil around the plant each spring to keep your nandina shrubs well fed.